Dr Simone Stumpf will lead a Human-Computer Interaction Design (HCID) seminar on 31st January focusing on interface and interaction issues for end users of systems employing text classification. "Teaching a New Dog Old Tricks - Supporting Interactive Machine Learning through Explanatory Debugging" is the title of the first Human-Computer Interaction Design seminar for 2014. It will be led by Dr Simone Stumpf on 31st January. Dr Stumpf, a Senior Lecturer in Human-Computer Interaction Design at City University London will explore the interface and interaction issues facing users of systems employing text classification. Spam filters, automatic filing systems, task-aware file managers and intelligent decision support systems are examples of systems that are built on the input of end users. Though these systems are often reasonably reliable, they can sometimes be faulty. The seminar, which takes place from 1-2pm in Room A108 in the College Building, will also provide an overview of machine learning research from an end user programming (EUP) perspective. "This work, in collaboration with Oregon State University, considers the way end users (who are not experts in machine learning) can be better supported in an iterative interaction cycle where the system explains its reasoning to the user and the users corrects the system's behaviour. While this has important implications for algorithm design and system testing, my presentation will focus on a series of studies which examine interface and interaction issues for end users of systems employing text classification." Dr Stumpf is a member of the End Users Shaping Effective Software (EUSES) consortium, an international collaboration between, amongst others, University of Washington, Carnegie Mellon University, University of Cambridge and IBM, to develop and investigate technologies that support end users to directly influence software behaviour. 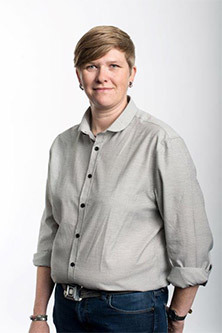 She was Co-Investigator on the "End-user debugging of machine-learned programs" project, funded by the National Science Foundation (USA) and is currently Co-Investigator on the EU-funded "EMBalance" project to develop an intelligent decision support system for the diagnosis and treatment of balance problems. Simone also has professional experience as a User Experience Architect, and is heavily involved in consultancy activities through the City Interaction Lab. Persons wishing to register their interest in attending the seminar should contact Daniel Holliday.